Prime Minister Justin Trudeau and U.S. President Donald Trump met face-to-face today for the first time today since the disastrous G7 summit in Charlevoix, Que., last month. Both leaders are in Brussels this week for North Atlantic Treaty Organization meetings. The Prime Minister's Office said Trump and Trudeau "had a conversation on the margins of the meetings today about trade, including NAFTA." There are no other deliberate, structured bilateral meetings planned between the two leaders. "I look forward to having words with President Trump, having a conversation with him, as I always do," the prime minister told reporters Tuesday following a whirlwind visit to Latvia, where Canada has 455 troops deployed as part of NATO's Operation Reassurance. Relations between Canada and the U.S. were dropped into a deep freeze following the imposition of steel and aluminum tariffs by the Trump administration — an action that triggered swift, sweeping countermeasures from the Liberal government. Trump took Twitter swipes at Canada following the G7 summit — mostly over Canadian dairy policy — but reserved his most persistent and personal attacks for Trudeau himself, calling him "dishonest" and "weak" for telling the closing G7 news conference that Canada would not be "pushed around" on trade. White House officials piled on, characterizing the prime minister as a back-stabber. Trump's trade adviser Peter Navarro went as far as telling a U.S. talk show that there was "a special place in hell" for Trudeau, though he later walked back the remark. Going into the NATO summit, Trudeau tried to present the appearance of business-as-usual for the alliance and insisted the lines of communication with Washington remain open. "I speak with [Trump] fairly regularly and I look forward to seeing him again," he said. There's a big target, however, painted on Trudeau's back. On his way to the summit, Trump fired off another Twitter volley: "Many countries in NATO, which we are expected to defend, are not only short of their current commitment of two per cent (which is low), but are also delinquent for many years in payments that have not been made. Will they reimburse the U.S.?" NATO doesn't work that way, of course. Members don't pay dues, although they do contribute to common military and civilian programs — and Washington pays almost one-quarter of those costs. The formula is based on national income; no NATO ally is in arrears. Trump does want NATO members to "pay up" and meet the two per cent benchmark the alliance has set as a defence spending target. Trudeau said Canada will not double its defence budget to get to that mark. "It's an important metric, among others, to gauge how countries are doing in term of contributors to NATO," the prime minister said. "But ultimately the more important metrics are always … countries stepping up consistently with capacities that NATO needs." 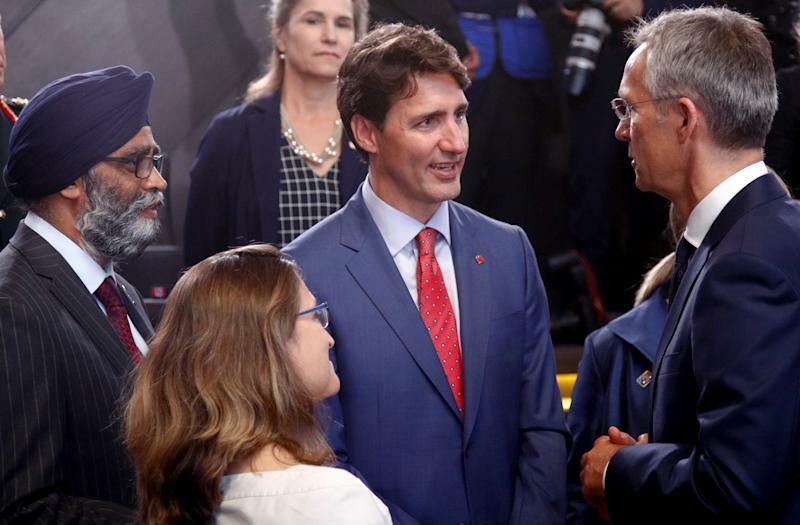 And while in Brussels Wednesday, Trudeau announced that Canada will assume command of a new NATO training mission in Iraq that will include the deployment of up to 250 Canadian Armed Forces personnel for one year. The troops will be deployed to Baghdad and the surrounding area, along with up to four Griffon helicopters to support NATO activities.